In a world-first study published today, researchers have found that fish in the wild respond adversely to ocean acidification. “Fish living at natural carbon dioxide seeps have abnormal behaviours similar to what we’ve observed in previous laboratory experiments,” says the lead author of the study, Professor Philip Munday from the ARC Centre of Excellence for Coral Reef Studies (Coral CoE) at James Cook University. He adds that these carbon dioxide levels are similar to what is predicted for the oceans in the second half of the century. “We see small fish being attracted to, instead of avoiding, the smell of their potential predators,” Professor Munday explains. The collaboration involving the Coral CoE, Australian Institute of Marine Science, Georgia Institute of Technology and the National Geographic Society is the first to shift out of the science lab and into the natural environment to study the effects of ocean acidification on fish. The isolated ‘natural laboratory’ where the study was conducted lies just off the coast of Papua New Guinea, where coral reef waters are made acidic by the natural carbon dioxide seeps. Dr Jodie Rummer, a co-author of the study from the Coral CoE, adds that while the higher carbon dioxide levels do affect fish behaviour, it does not appear to affect their athletic performance. Professor Munday adds an important finding is that fish behaviour did not seem to improve, despite the fish from the carbon dioxide seep residing in acidic waters all of their lives so far. “This suggests that fish cannot adjust to rising carbon dioxide levels over a lifetime,” Professor Munday said. Up until now, studies of ocean acidification effects on fish have mostly taken place in short-term laboratory settings with limited space and species. So, very little is known about the effects of ocean acidification on ecological processes in natural reef communities. The seep crucial to forming the natural laboratory takes the form of carbon dioxide bubbles fuelled by volcanic activity under the seabed. Close to the seep, there is no coral growth, but further away lies a unique coral reef zone with carbon dioxide levels similar to what is predicted to be ocean-wide by the end of the century. This makes the location ideal for studying how fish and other coral reef species may respond to the extent of ocean acidification forecast for the next 50-80 years. Interestingly, there were similar numbers of species and similar abundances for most fish at the site compared with the ‘control’ reefs outside of the seep zone. There were, however, fewer predatory species at the seep site and this may explain why, despite their altered behaviour towards predators, populations of fish were still in abundance. 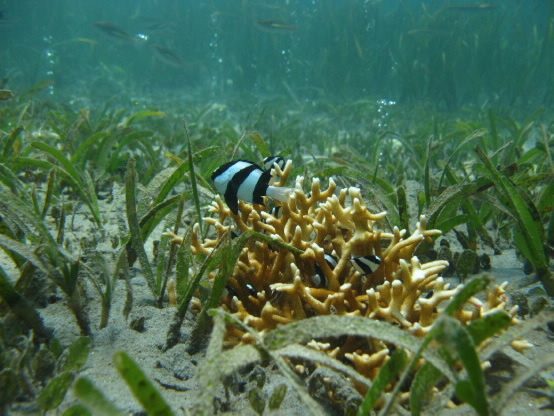 Recruitment of juvenile fish from reefs outside the seep may have also helped - but in future such refuges will not exist as all oceans become acidic due to human-induced carbon dioxide emissions. The findings of this study will be of particular concern to the millions of people in the tropics who depend on coral reefs for food security and livelihoods. ‘Behavioural impairment in reef fishes caused by ocean acidification at CO2 seeps’ by Philip L. Munday, Alistair J. Cheal, Danielle L. Dixson, Jodie L. Rummer and Katharina E. Fabricius appears in Nature Climate Change. The paper and images are available on request.